Peer through railings on Memorial Drive at Leverett House’s McKinlock Hall and you will see between two arched windows a bell hanging in a small timber bell-frame about 15 feet above ground. Insinuate yourself into the Leverett courtyard, and you will discover that it is a bell of rather modest size, about a foot across at bottom. It has no ropes with which to ring it, no doubt a frustration to the undergraduates in the House. Across the front of the mount, “Pennoyer” is carved into the wood in script. What is this all about? you ask yourself. Roger Thompson, professor of American history at the University of East Anglia, Norwich, Norfolk, England, answers your question in a dispatch to this magazine. The bell was given to Harvard in 1945 by the village of Pulham St. Mary , near Diss, Norfolk, where it had hung in the tower of their school since 1790 but had recently been removed because the belfry had rotted. Unlike the case of certain Russian bells, no one will be asking for this bell back because the school was closed in 1988. 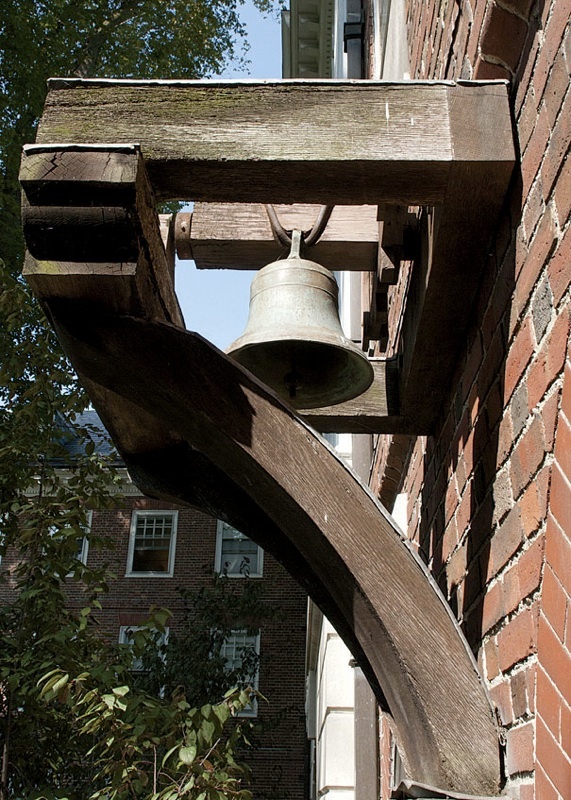 Thompson learned how the bell came to Harvard from a letter written by a former Pennoyer scholar, Grant Palmer Pennoyer, A.B. 1915, M.D. ’19. His eldest daughter, Virginia, who was working for the State Department in London in 1945, visited the Pennoyer school in Pulham St. Mary and revealed her identity. They made a big fuss over her, her father wrote, but when they offered her a bell, she only smiled. She did tell her father about it, and he wrote the head of the school to say that he would be delighted to accept the bell. He thought the most suitable place for it would be Harvard and suggested it go to Leverett House because John Leverett, A.B. 1680, S.T.B. ’92, president from 1708 to 1724, had been an early Pennoyer beneficiary. As a young fellow and tutor of the College, he had received £20 from the Pennoyer bequest in 1694. And so it came to pass. Illegitimum non carborundum. Oceanographer Allan R. Robinson  ’54, Ph.D. ’59, had a profound understanding of the Gulf Stream, which earned him respect in learned circles worldwide, according to an account of his career written last year by colleagues for the minutes of the Faculty of Arts and Sciences after the death of the McKay professor of geophysical fluid dynamics emeritus. Members of the Harvard Band  came to his memorial service and burst into song.